Back in 2009, when I was first learning the writing industry and seriously seeking publication, God joined me with a group of ladies to help me along my quest. I was invited to join Inkwell Inspirations, a new writers blog comprised mostly of writers who had won writing contests (I had just won the Touched by Love contest) but were still unpublished. Over the next years, we would become not only blogmates, but also close friends, prayer partners, and in many ways a writing team. So it's not surprising that we decided to band together on a writing project, and Austen in Austin was born. It was a labor of love, as the published ladies sought to help the unpublished ladies achieve that esteemed goal, although at this point each of the Inkies has several published works to their names. Several more years passed before the dream became a published reality, but I'm happy to share it with you today. 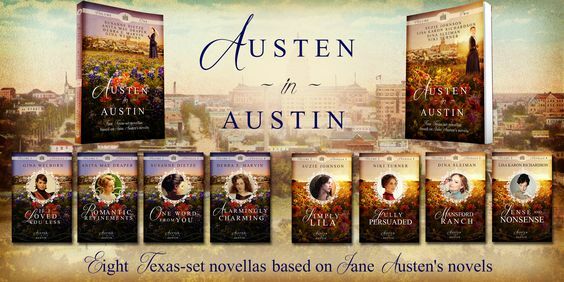 As you can see, these eight fun Texas-set novellas are based on Jane Austen's novels. The Ladies of Inkwell Inspirations had such a great time working together inventing these stories with their overlapping settings and characters and their Austenian plot lines, and I just know that you'll enjoy them too! They're written by some great established names in Christian fiction like Lisa Richardson, Gina Welborn, and yours truly, as well as some Inky authors who you might not have read yet, but will soon become favorites. I highly recommend reading the stories in order for the full experience of the overlapping characters and settings. The ebooks are a great deal at only $3.99 each for a volume of four delightful stories! A misguided academy graduate spends the summer falling in love . . . twice. Yearning to find a real-life hero, a wallflower must learn to live outside the pages of an Austen novel. A brokenhearted artist struggles with the shame of her family s bankruptcy and the return of her first love whose proposal she d spurned because he was poor. An aspiring novelist with a keen eye for character must determine who is worthy of playing her own leading man. A would-be missionary is determined to make it to Ceylon, but when her funds disappear, she has to accept help from the man she most wants to avoid. And in case you're wondering, yes, you can purchase the novellas individually in ebook format, but at $2.99 each, it's a much better deal to buy a set of four for $3.99. Be sure to check out these fun novellas and share them with your friends! This was such a great experience. I will always treasure the journey we took to get here - two published collections! Yay for Austen in Austin! It was so much fun to see this idea go from a side-conversation to a real life book. The best part is conceiving and writing it with friends! Toying with a new series!